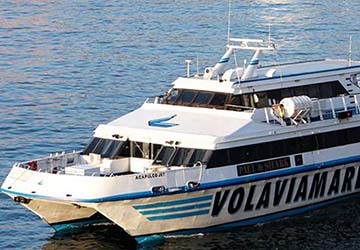 The Castellammare di Stabia Sorrento ferry route connects Italy with Italy and is currently operated by 2 ferry companies. The Alilauro service runs up to 14 times per week with a sailing duration of around 20 minutes while the Seremar service runs up to 7 times per week with a duration from 50 min. So that’s a combined 21 sailings on offer per week on the Castellammare di Stabia Sorrento route between Italy and Italy. Compare now and get the best fare at the time that you want to travel. Stabia is located on the Bay of Naples in the Province of Naples in the Campania region of southern Italy. It is around 30 km to the south east of Naples and is situated adjacent to the ancient Roman city of Stabiae which was destroyed by the Vesuvio volcano eruption in 79 AD. An archaeological excavation of the Roman villas, which were preserved by the volcanic eruption, is currently taking place. There are many things to do and see in the region including taking in the wonderful architecture, the many churches and the wonderful works of art of the old town centre. All of this, and the ancient archaeological finds of Stabiae, make this a perfect place for a relaxing vacation, especially for travellers who want a pleasant mix of culture and amazing beaches. Currently the port is used for commercial, tourist and fishing vessels. There are also shipyards and it is the third largest port in Campania after Naples and Salerno. Ferries can be taken from the port to Capri and Sorrento.